Blue-streak Cleaner Wrasse (Labroides dimidiatus), cleaning inside the mouth and gills of a Tomato Grouper (Cephalopholis sonnerati), also known as Tomato Rock Cod. Found throughout the Indo-West Pacific, including Great Barrier Reef, Australia. Tomato Grouper (Cephalopholis sonnerati), also known as Tomato Rock Cod. Found throughout the Indo-West Pacific, including Great Barrier Reef, Australia. Queensland Groper (Epinephelus lanceolatus). Also known as Queensland Grouper and Giant Grouper. Great Barrier Reef, Queensland, Australia. Classified Vulnerable on the IUCN Red List. Coral Trout (Plectropomus leopardus). Also known as Leopard Cod. Inhabits tropical coral reefs. Great Barrier Reef, Queensland, Australia and also found throughout most of South East Asia. Footballer Trout (Plectropomus laevis), also known as Chinese Footballer and Footballer Cod, being cleaned by Two-colour Cleaner Wrasse (Labroides bicolor) and Blue-streak Cleaner Wrasse (Labroides dimidiatus). Found throughout Indo-West Pacific. Black-tipped Grouper (Epinephelus fasciatus). Also known as Black-tipped Cod, Red-barred Rock Cod and Banded Rock Cod. Found throughout Indo-West Pacific, including Great Barrier Reef, Australia, but geographical variations. 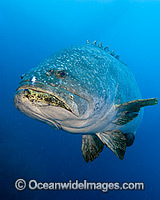 Queensland Groper (Epinephelus lanceolatus), size: 220cm. 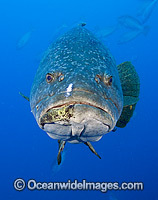 Also known as Queensland Grouper and Giant Grouper. Throughout Indo-West Pacific. Photo taken on SS Yongala shipwreck, Great Barrier Reef, Qld, Australia. Classified Vulnerable on IUCN Red List.